This New Years Salad is not just super delicious but its also very healthy and full of vitamins. I created this salad myself and my kids love it very much. 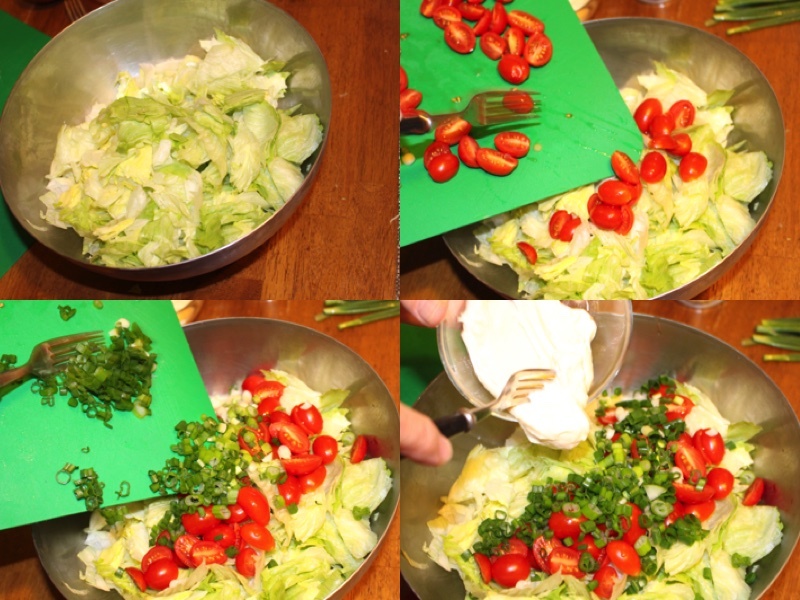 2) Cut the lettuce vertically into 2 equal pieces. We are only going to use one of the pieces for this salad. Take that one half and cut into smaller pieces or the size of lettuce that you prefer in your salad. 3) Cut all the cherry tomatoes into two equal halves. 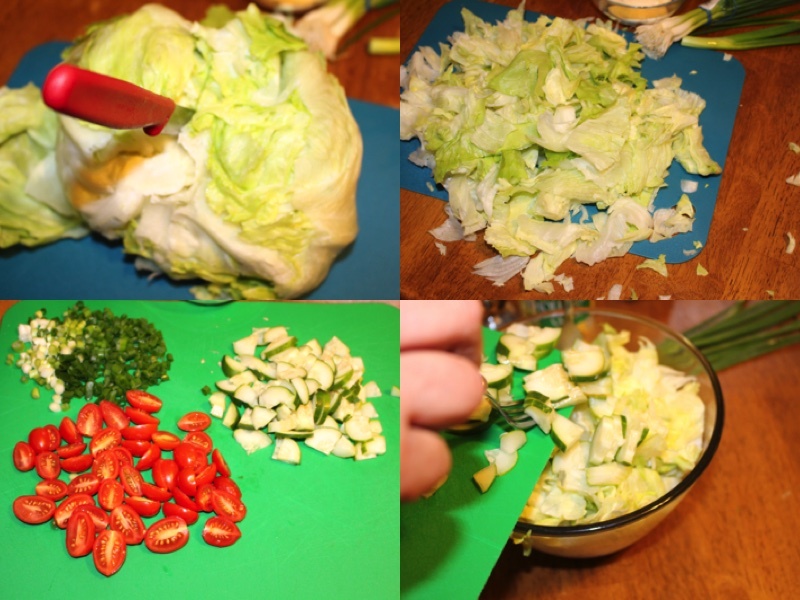 4) Chop the green onion into small pieces and the cucumber as well. 5) Put it all into a medium size bowl. 6) Add mayonneis to the bowl of ingredients. 7) Add salt and black pepper. 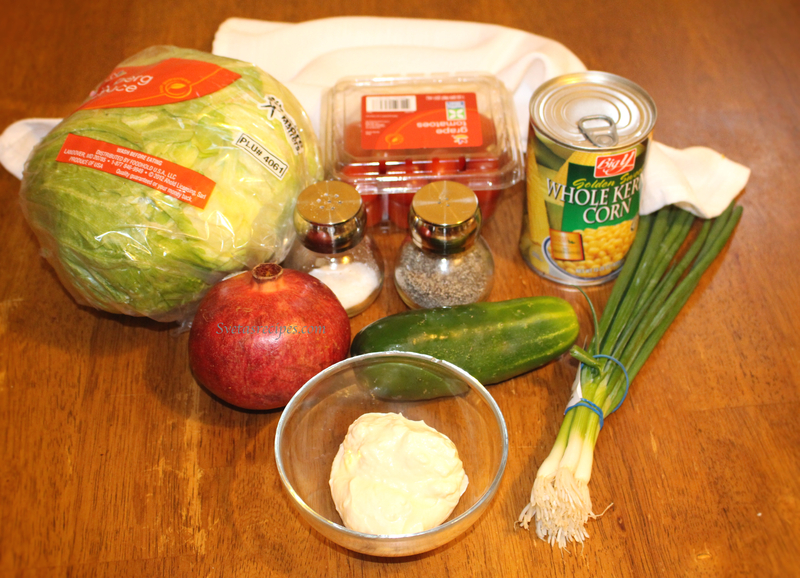 8) Add half of the can of corn into the bowl and leave the other half for decoration of the salad. 9) Peel the pomegranate and take half and add to the bowl and leave the other half for the decoration of the salad. 10) Mix everything together inside the bowl and then place it in a dish in a shape of a christmas tree. 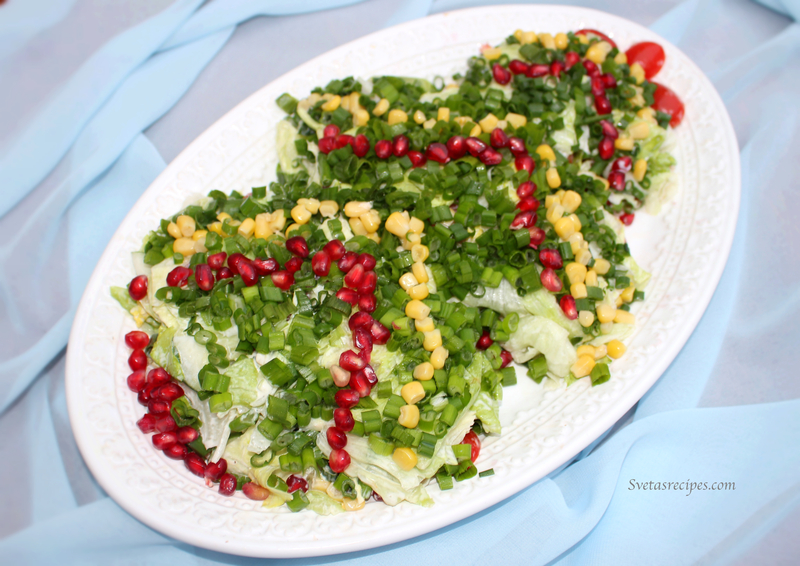 11) Use the left over pomegranate and corn to decorate the salad. Look at the main photograph for assistance. Cut the lettuce vertically into 2 equal pieces. We are only going to use one of the pieces for this salad. Take that one half and cut into smaller pieces or the size of lettuce that you prefer in your salad. Cut all the cherry tomatoes into two equal halves. Chop the green onion into small pieces and the cucumber as well. Put it all into a medium size bowl. Add mayonneis to the bowl of ingredients. 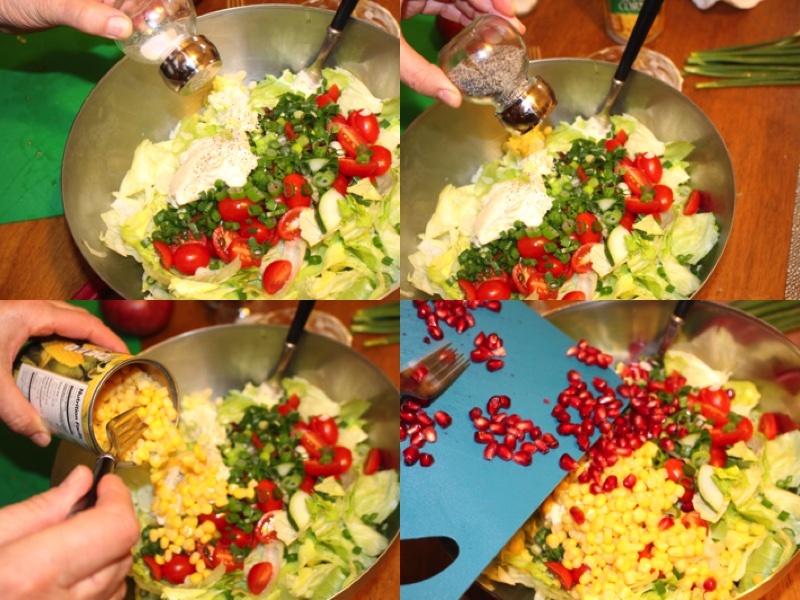 Add half of the can of corn into the bowl and leave the other half for decoration of the salad. Peel the pomegranate and take half and add to the bowl and leave the other half for the decoration of the salad. Mix everything together inside the bowl and then place it in a dish in a shape of a christmas tree. 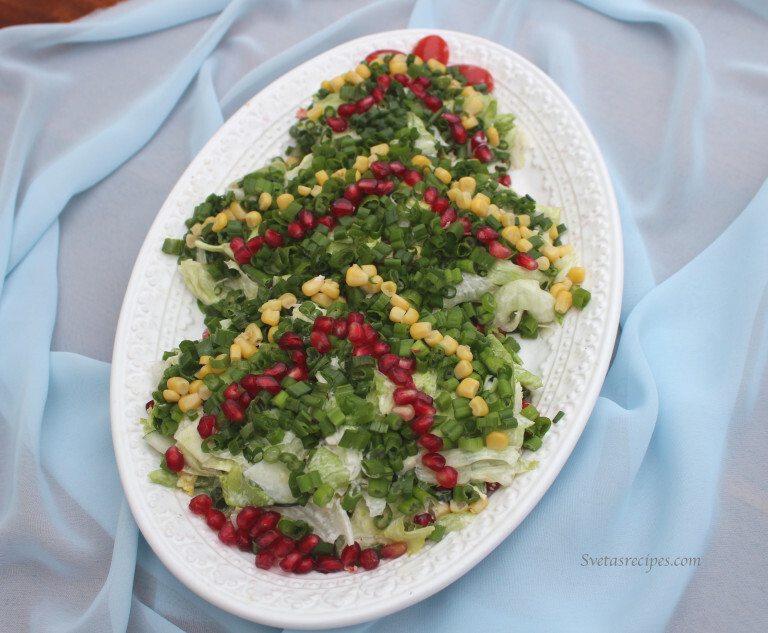 Use the left over pomegranate and corn to decorate the salad. Look at the main photograph for assistance.